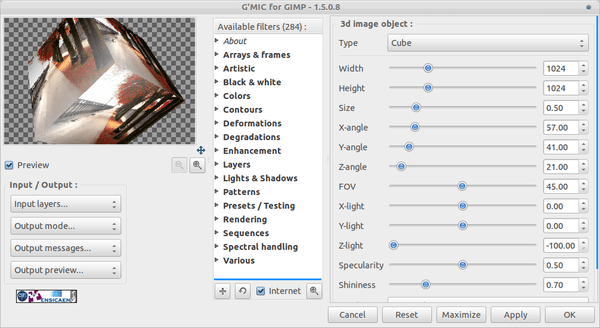 G’MIC (GREYC Magic Image Converter) is a gimp plugin for retouching images, currently GMIC 1.5.0.8 come with the image filters and effects more than 284 and 15 category for converting, manipulating, filtering and multi-spectral visualizinggeneric 1D/2D/3D image datasets. GMIC and working on Ubuntu, Other Linux variants, Windows and Mac OS. To use G’MIC once installed, open a picture or photo in GIMP and go to Filters >> G’MIC and a dialog will pop-up where you can select the effect you want to apply. Each effect is of course customizable and you can see a live preview in the G’MIC window.